'AFTER consultation with a number of senior leaders I have decided to appoint Commissioner André Cox as Chief of the Staff and Commissioner Sylvia Cox as World President of Women’s Ministries, effective 1 February 2013. 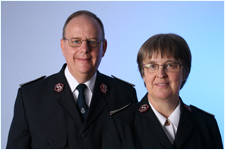 The commissioners – officers of the Switzerland, Austria and Hungary Territory – are currently serving as Territorial Commander and Territorial President of Women’s Ministries of the United Kingdom Territory with the Republic of Ireland. 'Commissioner Barry Swanson, currently serving at International Headquarters (IHQ) as the Chief of the Staff, and Commissioner Sue Swanson (World President of Women’s Ministries), are appointed to the leadership of the USA Eastern Territory. 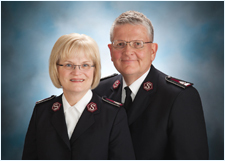 Commissioner Barry Swanson is appointed as Territorial Commander, USA Eastern Territory, and Commissioner Sue Swanson as Territorial President of Women’s Ministries, also effective 1 February 2013. 'I want to express my deep gratitude to Commissioner Barry Swanson for the strong support he has been to me as General. Both he and Commissioner Sue Swanson have been valued team members and exemplary leaders. They have given sterling service at International Headquarters and throughout the Army world. The different appointments they have held through the years prepared them in a special way to take on the roles at IHQ which they have held with distinction in recent years. I salute them and commend them to the USA Eastern Territory as strong, progressive, spiritual leaders.